Gater-Pro 3 is a fabulous little plugin - simple in concept but powerful in realisation, and highly recommended to producers of all kinds of dance music, not just trance. Powerful and flexible, but easy to use. 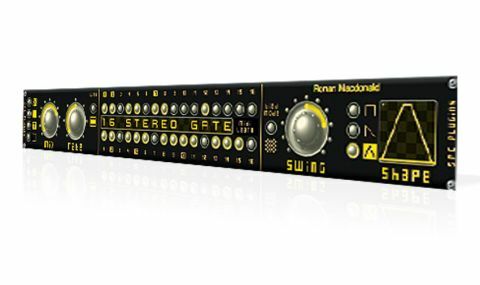 SPC's VST/AU "trancegate" plugin is a gate sequencer that can be run in 16-step split (independent patterns for the left and right channels) or 32-step linked stereo modes. "Each of the three gate envelope shapes can be "skewed" by dragging the Shape graphic"
Three basic gate envelope shapes are on offer (square, triangle and saw), each of which can be "skewed" by dragging the Shape graphic. Two Tied modes set strings of tied notes triggering the gate to conventional "100% open" behaviour (Fill), or with the envelope applied across the length of the series (Stretch).This is one of GP3's best features, introducing a level of rhythmic expression that your average trancegate can't match. Beyond that, you've got Rate (1/4 to 1/128), Mix and Swing controls, a Randomise function and buttons for activating and deactivating all steps and turning all Ties on (but not off, for some reason).